Be generous with information: Don has created a website dedicated to this story. Check out http://strongmansandow.com/. You’ll find lots and lots of information about his creative process, historical facts, great images, and links to fascinating videos! I’m planning on doing something very similar with Play Like a Girl, which reminds me, I’d better grab a domain for the PLAG website, a.s.a.p. Connect with readers in a personal way: I love how Don's friendly voice rings true in his posts. Consider the post titled "What’s Up With The Medallion Hanging from Sandow’s Neck?" In it, Don explains the how some facts, and the omission of others, served to guide his decisions regarding what to include in the story. Being that Sandow's religious affiliation is unclear, yet the star medallion suggests otherwise, Don chose to leave the medallion off of the "dude" in his illustrations. Best not mislead his readers with ambiguity. Be an expert in your topic: Don is a fitness fanatic, pure and simple. He’s a swimmer, a yogi, a “gym rat”, and was once a body-builder himself. We capitalized on his expertise in the Educator’s Guide by adding a weekly Fitness Plan using his illustrations as graphics. Hopefully kids will become inspired to become as strong as Sandown...and Don, too. I want to wish Don all the very best with his book launch being held at Book People in Austin on Saturday, September 9. He’s been planning the launch for a year now (Take note, Deb.). It’s sure to be a colossal event, particularly because he is featuring modern-day strongman Andrew Perlot as a main attraction. He and Don are sure to wow the crowd. I wish I could be there with him. Don, my friend, I’m with you in spirit! Have a grand time! Authors and Illustrators, it's time to get a winning school visit game plan in place. Anymore, though, schools are requiring more of you than simply inspiring kids to fall in love with the written word, aren't they? Yep. Educators want your presentation to be academically sound, too. And, furthermore, they want documented proof that you're going to deliver the goods. 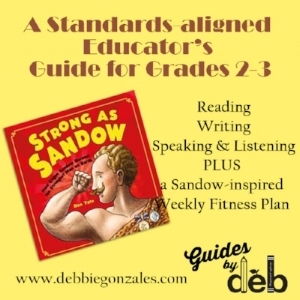 Recently, a librarian asked author/illustrator Don Tate to present documentation showing how his school visit presentation aligned with the Common Core State Standards. "Not a problem," I told him. Together, he and I met this librarian's request with ease. Don described his engaging, well-planned presentation to me, point by point. After spending some time analyzing and strategising, I comprised a detailed document packed with CCSS annotations and follow-up activities that he can confidently take with him wherever he pleases. The most satisfying part of this project was to witness the relief Don expressed when he realized that he wouldn't have to alter his presentation format one iota. Score! With each guide I work to create something that will help keep the book in the minds of teachers and librarians for a long time. Something that they can easily pull up and reuse. Something that the kids can make by themselves. The objectives of teacher guide exercises must stem from the varied themes presented in the story. And, I try to create activities in which the kids must repeatedly refer to specific pages in the book. Gotta keep that book in their hands! The overarching theme in Don Tate's It Jes' Happened: When Bill Traylor Started to Draw is the passage of time. It is a remarkable tale of a man who, while in his 80's, began to draw pictures depiciting the vivid memories of his life as a slave, a sharecropper, and a freeman. This great story is pieced together with multiple references of time and place, more so than in many picture books I've seen. So, I thought, since the aspects of time and place are critical to Bill Traylor's story, let's make a timeline! There is some assembly required to create this project. Not to worry, though. It's super easy to make. Everything you need is listed in the guide. With a little glue, some scissors, and the book in hand the incredible events of Bill Traylor's life and death can be chronicled over and over again. There are lots of other interactive activities in Don's guide. For instance, comprehension is reviewed by working an awesome crossword puzzle. There's a writing exercise built around writing in a character's point of view. And a poetry activity in which the students pull from their own memories as inspiration - the best kind. So, get the book, download the guide, and have yourself some grand old fun! Make it jes' happen. It's an exciting new day in Debbie Land. I'm just about to dig in an create a new companion guide for my buddy Don Tate. 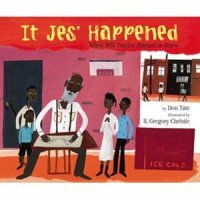 His latest book, It' Jes' Happened: When Bill Traylor Started to Draw, has already scooped up a ton of accolades. It's just that good. So stay tuned to see just what I can come up with to do this great book justace. I'm crazy proud of Don, because the text mirrors his thoughtful and considerate nature. I swear I hear his voice as I read these moving words over and over again. I can't show you the guide yet. For now, enjoy this video clip and I'll get back with you as soon as I can.